Foodie Freebie Friday: Dairy Goodie Pack! Happy Monday and welcome back to Foodie Freebie Friday! I hope you had a great weekend with some culinary adventures of your own. This week we're celebrating National Dairy Month with the Midwest Dairy Association. I'm not sure about you, but I couldn't live without dairy in my diet. I simply need cheese in my life and it's certainly one of my weaknesses! Milk packs nine essential nutrients at only 25 cents per glass. Many designer drinks, sodas and fruit drinks are high in calories and expensive, which won't help your wallet or waistline. Thought protein is one of the most expensive parts of the diet, dairy foods are one of the most economical sources of protein and calcium, both of which are important for the growth and development of strong bones and teeth. A one-ounce serving of hard cheese, like cheddar, contains 8 grams of protein, and an eight-ounce serving of yogurt provides nearly a third of your suggested daily calcium intake. In honor of National Dairy Month, I'm giving my readers a chance to receive free gallons of milk and a dairy goodie package compliments of the Midwest Dairy Association. 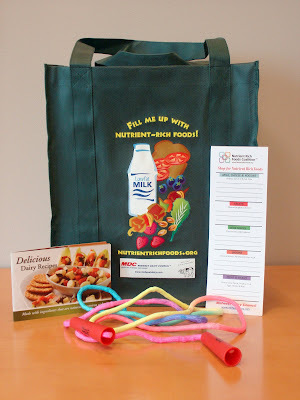 The dairy goodie package includes a reusable shopping bag, jump rope, recipe booklets, magnetic fridge pad and 10 VIP coupons for a free gallon of Dean Foods milk! Just think, all that milk can lead to some great ice cream making for the summer! Are you ready to get your dairy on? - What's your favorite dairy product? Deadline: Thursday, June 18, 2009 at 12 midnight CST. ONE WINNER will be randomly chosen by Random.Org's Interger Generator based on the number of your comment and will be announced on Friday, June 19, 2009. Good luck! I am simple a cold glass of skim milk. I love just about anything dairy but my favorite thing to do when I could care less about the calories or fat is to just sit there with a hunk of sharp cheddar cheese and some crackers. Maybe some wine, who knows! cheese. cheese. cheese. I can't live without it. Any kind, the stinkier the better - I once ate only cheese and bananas and wholegrain bread for a couple of months as a child. I could not live without cheese!! Yogurt. and Cheese. Really, I couldn't imagine my diet without dairy! I have to have it on every plate i serve myself!! I can't live without yogurt! I love cooking Indian curry and baking yogurt cake with it! But eating it plain or with granola is hands down the best way to enjoy it. ICE CREAM! Cheese runs a close second. I love all things dairy, but if I had to choose one thing I couldn't live without it would be simply skim milk. Ice cold. So refreshing. I love a cold glass of milk..best ever! In my fridge I always have a chunk of parmesan or pecorino, as well as a container of cottage cheese. I find both to be perfect for snacking, as well as complements to many other foods. Definitely cheese - I've yet to come across one I don't like! Definitely CHEESE! Any kind! Some of my favorites include Raclette, Stilton, Brie and Gruyere. I couldn't live without cheese or yogurt! Great giveaway! Extra sharp cheddar cheese is my fave diary product. A nice cold glass of 2% milk in the morning is my favorite way...unless you count chocolate ice cream of course! That's an easy one...CHEESE! Pretty much any kind, though I love soft cheeses like Brie. PS- I have been following this blog for a long time now and I have to say, you are incredibly talented not only with your recipes, but also in the way you write about your experiences in the kitchen! Bu I do love all dairy products! Absolutely, beyond a doubt, most definitely CHEESE!!! !